A Revolutionary Approach To Resolving Saddle Fit and Equine Comfort Issues. EquiPedic, Inc. believes that a systems integration approach to saddle fit is necessary to achieve maximum results. They believe that there are several factors that are affected when you place a saddle on a horse. Some of these include, pressure points, impact, heat retention, moisture management, blood flow and transcutaneous oxygen transfer to the muscles and skin on the back of the horse. Even the most perfect fitting saddle doesn't address all these factors. EquiPedic believes that the saddle pad should offer more than just congruence (fit and shape) and compliance (shock absorption) in order to maximize a horse's performance and comfort. EquiPedic recently enhanced its line of saddle pads that regulate the surface body temperature of horses. They incorporated smart responsive textiles (HolofiberTM and phase change material) into a thin felt layer that comes into contact with the horse's back. EquiPedic's patent pending technology works with the equine body's own energy system to increase oxygen levels, build strength, accelerate muscle recovery, and lower the body surface temperature. The EquiKool Temperature Management SystemTM (ETMS) uses phase change material to addresses the heat retention issue of saddles and pads by lowering the surface temperature of the horse's body by as much as 4-7 degrees for extended periods. Keeping the horse cooler allows the horse to perform better. The EquiCharge Oxygen Energy Recovery SystemTM (OERS) uses HolofiberTM to increase transcutaneous oxygen levels to the horse's back muscles and skin. The statistically-significant increase of blood flow and increased oxygen levels was demonstrated in a double blind study on diabetic and vascularly impaired patients performed by Dr. Lawrence A. Lavery, MPH at Loyola University Medical Center in Chicago earlier this year. Dr. Lavery stated, "The significant changes observed are compelling for this type of product. An 8-12% improvement in skin oxygenation could increase marginal circulation enough to improve wound healing or eliminate ischemic (localized tissue anemia due to the obstruction of inflow of arterial blood) pain...". Extensive equine testing is continuing to validate comparison between human and equine results, and to determine added benefits such as the elimination of "white hairs". The Tempur-Pedic advanced pressure relieving material used in EquiPedic's pads is different from that found in beds and other saddle pads. It is a military grade version of the foam with greater impact and load dispersion capabilities that retains the temperature sensitive form fitting features of the bed foam. This allows for great pressure management and impact capabilities while still allowing the foam to form fit to the horse's back and the saddle's tree, helping to eliminate saddle fit, impact and pressure point issues. 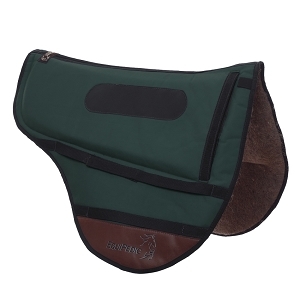 The material provides a superior method for protecting the horse's back from both rider and saddle. The top layer of the EquiPedic saddle pads is another thin layer of felt bonded to either a non-slip mesh fabric or non-backed Cordura. The use of these materials enhances moisture management greatly, allowing sweat to be removed from the horse's back by both moisture transport and evaporation. This further reduces the skin surface temperatures on the horse's back. The combination of the EquiCharge Oxygen Energy Recovery SystemTM , The EquiKOOL Temperature Management SystemTM and the Tempur-Pedic advanced pressure relieving material turn these saddle pads into an active cooling, rapid energy recovery and comfort management system that is unmatched in the industry. "These unique features can give the rider and the horse an extraordinary advantage when performing, especially in endurance, 3-day eventing, and hunter/jumper events", said Richard Sacks, EquiPedic's CEO.